CPA’s CEO – Alex Malley Has a New TV Show ! CPA’s CEO, Alex Malley returns to the Nine Network on Sunday 7 February with a new series, The Conversation with Alex Malley. Following on from the tremendous success of three seasons of The Bottom line, the new show will air at 10.00am on Sundays and reveal the moving life stories of influential leaders. The inspiring, though-provoking guests will discuss their big lives and how they’ve made a real difference, through conversations with Alex. Channel Nine’s legendary political commentator Laurie Oakes; Atari Founder and entrepreneur Nolan Bushnell; Opposition Leader Bill Shorten; World Vision CEO Tim Costello; journalist and television presenter Deborah Knight;. There will also be an exclusive interview with Alpha Cheng, the son of NSW Police employee Curtis Cheng who was murdered outside the police headquarters at Parramatta in Sydney last year. Don’t miss The Conversation with Alex Malley 10.00am Sundays from February 7 on the Nine Network. 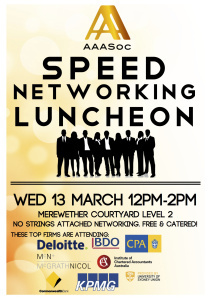 AAASoc will be holding our signature Speed Networking Luncheon in Semester 1 week 2! 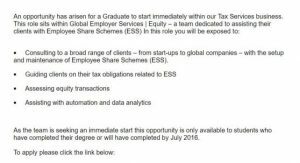 This event is open to all students of any major or degree, not just accounting! 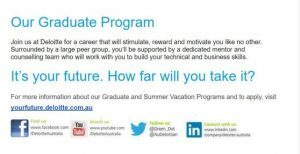 Join us in gaining further insight in career opportunities in Australia such as graduate and vacationer positions as well as first year programs. Ask your burning questions to firm representatives for advice or simply get to know the different industries, service lines and the culture. Also a great opportunity to network with members in AAASoc, learn about what we do and share your interest in joining the society as a sub-committee member or executive. LUNCH IS PROVIDED – FREE SUSHI. 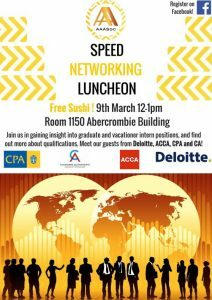 Firms attending include Deloitte, CPA, CAANZ, ACCA and EY. Don’t miss your chance to meet The Naked CEO, Alex Malley, chief executive, CPA Australia. Alex will also be available to sign copies of his book The Naked CEO. 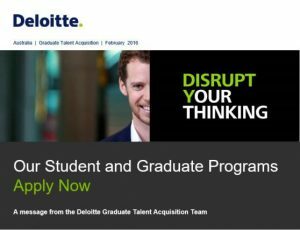 With so many reputable employers in the one spot, here’s your chance to talk to them aboutgraduate and internship opportunities. Exhibitors include AFP, Aussie, GE, KPMG and more.